Abstract: Corsair is well known for producing some of the highest quality DDR memory there is. Corsair is well known for producing some of the highest quality DDR memory there is, and unlike some other manufacturers which share the same distinction, Corsair's memory is readily available and easy to get a hold of. Now, we recently looked at Corsair's 256MB XMS3200 CAS2 DDR memory module and were quite impressed with what we saw. The question on the table today is whether the just announced Corsair XMS3500 DDR memory would fill the shoes, and offer even more. With the likes of OCZ and GeIL having released PC3500 (DDR 434) it was time for Corsair to respond. Corsair did not just answer with their own XMS3500, they "one up'ed" the competition by releasing memory capable of running at PC3500 speeds while keeping the aggressive CAS2 and CMD Rate 1T timings with default voltage! Sure it's great when memory can run at a high speed, but if the module can only do it with conservative memory timings it can be a bit redundant as we noticed when we reviewed the OCZ PC3000 DDR a while back. Since there isn't even a JEDEC standard for PC3200 it should be pretty obvious there is no standard for PC3500 either. In fack, all the high performance memory from manufacturers these days is basically just overclocked PC2100 or PC2700 DDR RAM. Also, since there is no JEDEC standard buyers/users should be careful aware of the potential for compatibility problems. 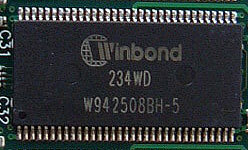 According to Winbond, the BH-5 DRAM is supposed to have a maximum top speed of 200 MHz (1000MHz / 5ns = 200 MHz) but Corsair is guaranteeing that it will run at 217 MHz no problems. In fact, Corsair 100% guarantees that the memory will not just run at 217 MHz but with a CAS Latency of 2 clocks and a Command Rate of 1T while only using 2.5V! Not too shabby! Anyone contemplating purchasing this memory is an enthusiast/overclocker so the name of the game is just how high will it go? Plugging the memory into our trusty Epox 8K5A2+ motherboard I immediately changed all the memory timings to the most aggressive available in the BIOS and set the FSB to 217 MHz. The system would POST but it hung while counting the memory, not exactly the best sign. Upping the memory voltage to 2.7V fixed that problem and it would load WindowsXP but would crash while running the Sandra's memory benchmark. I had to up the voltage to 2.8V before everything was stable. Unfortunately, the stick we tested would not go even 1 MHz above the 217 MHz mark with the most aggressive memory timings no matter what voltage I used. To be fair though, when testing the memory with the suggested memory timings I was able to hit 225 MHz FSB with a voltage of 2.8V. When I turned down the memory timings to most conservative, the Corsair XMS3500 would do an amazing 235 MHz FSB! However performance at those settings was lower than at 217 MHz with the most aggressive memory timings so higher MHz do not necessarily mean a performance gain.